Every woman desires healthy, plump and tight breasts. It is not perfect to have a beautiful posture and pretty face without the complementary exciting breasts. 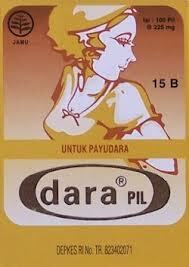 Dara Pill is a beauty product used to enlarge and tighten loose breast muscles. The pills beautifies the shape of your breasts, makes it fresh and smooth. Store below 30C, in a cool and dry place. Suggestion: In order to get satisfactory results, besides using Dara Cream the regular use of Dara Pill is also recommended.